Hillary Clinton, like President Obama four years ago, has spent a lot of time with a chance of winning the election that is somewhere between 60 and 80 percent in our forecast. Right now, she’s squarely in the middle of that range, with a 68 percent chance according to our polls-only model and 67 percent according to polls-plus. I’ve found that probabilities in the 70 percent range can be especially difficult to write about, because there’s the possibility of a misinterpretation in either direction. On the one hand, in a 70-30 race, you can usually cherry-pick your way to calling the race a tossup without that much effort, even when it really isn’t. We often saw that occur in 2012, when reporters and commentators consistently characterized the election as too close to call despite a fairly steady lead for Obama in swing-state polls. Wednesday was one of those glass-half-empty, glass-half-full days, where the same data — and there was a lot of it, with dozens of new swing-state polls — could be looked at in very different ways. On the one hand, if you thought the race was a toss-up (as some national tracking polls have it) the data convincingly argued otherwise, with Clinton holding onto leads in her “firewall” states, which are sufficient to win the Electoral College. On the other hand, Clinton’s leads are narrower than they were a few weeks ago, and any further tightening — or a modest polling error in Trump’s favor — could put her campaign in jeopardy. Furthermore, there’s a lot of disagreement in the polls, which speaks to the uncertainty in the race. Here’s all the data — every swing-state poll we’ve added since yesterday’s Election Update — in handy chart form. It includes the latest editions of the state tracking polls from SurveyMonkey and the Alliance of Automobile Manufacturers (which are conducted by Pulse Opinion Research, an affiliate of Rasmussen Reports). The good news for Clinton jumps out in the chart. She led in seven of eight live-caller polls — and 22 of 23 polls overall — in the states within her firewall. But some of her leads are tenuous, especially in Pennsylvania and — although the polls wildly disagree there — Michigan. And now and then a poll will crop up showing Trump competitive or even leading in a state Clinton thought she’d put to rest: There was one such poll today in Virginia, for example. That’s not to say Trump is likely to win Pennsylvania or (especially) Virginia. But he only needs to break through in one state to broach Clinton’s firewall, whether in Pennsylvania or Michigan or New Hampshire or Colorado. Outside her firewall, meanwhile, Clinton isn’t assured of much of anything. She got a bad set of polls in Nevada today, for example, and Florida and North Carolina are so close that Florida was split exactly 50-50 in a set of 10,000 simulations we ran at one point today. (There’s an 8 percent chance of a recount in Florida or another decisive state, incidentally.2) So if Clinton were to fail in any of her firewall states, she doesn’t have particularly reassuring backup options. 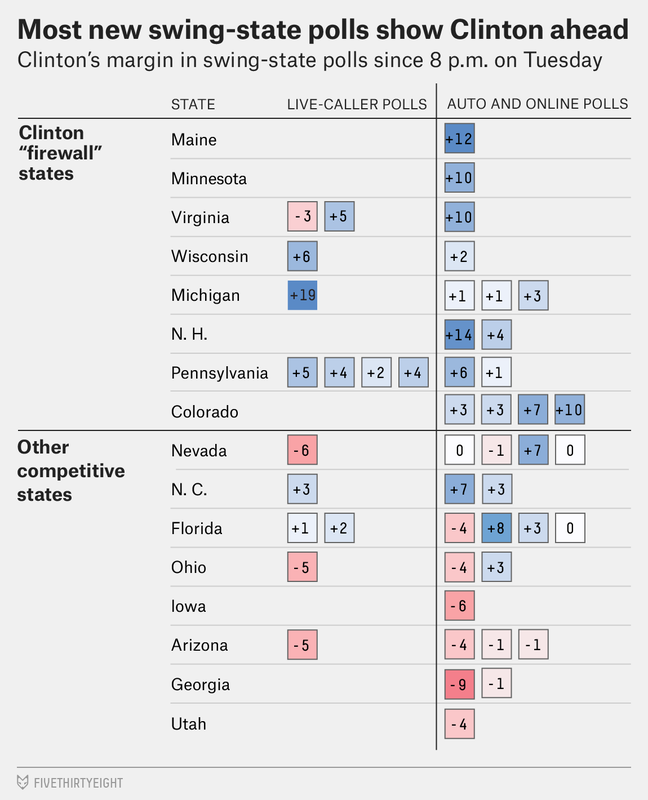 Overall, the swing-state polls were about in line with what the model expected. Clinton’s win probability fell slightly on the day, in fact, although it was as a result of her continuously mediocre numbers in national tracking polls. The state polls were a wash in our model. What’s harder to tell is whether Trump is still gaining ground, the race has stabilized, or if Clinton has even begun to rebound slightly. After several very good days of polling for Trump, today’s numbers were more equivocal. And remember that there’s a lag between a news event, when a state is polled, and when those polls hit our forecast. For example, if Clinton got especially bad numbers on Friday and Saturday after the FBI story broke, but has since recovered, we might not discover it until this weekend. Our Elections podcast is doing daily shows right up until Election Day. Our models have generally been well-aligned with betting markets, which reflect one type of conventional wisdom. We assume there will be a recount in any state where the top two candidates end up within 0.5 percentage points of each other. In practice, recount rules vary from state to state.